The GridViewImageColumn derives from GridViewBoundColumnBase, which means that it inherits all of the functionality too. In addition, it allows you to easily configure the image's height, width and stretch. ImageStretch - determines the stretch mode for the images displayed in the column. ImageHeight - height of the images displayed in the column. ImageWidth - width of the images displayed in the column. You can bind GridViewImageColumn to a string or a byte data via DataMemberBinding property. 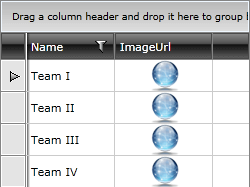 Example 1: Define GridViewImageColumn in XAML. You can have a look at the Image Column Filtering demo from the SDK Samples Browser for a good example of how to override GridViewImageColumn's distinct values to be images and not a string path.